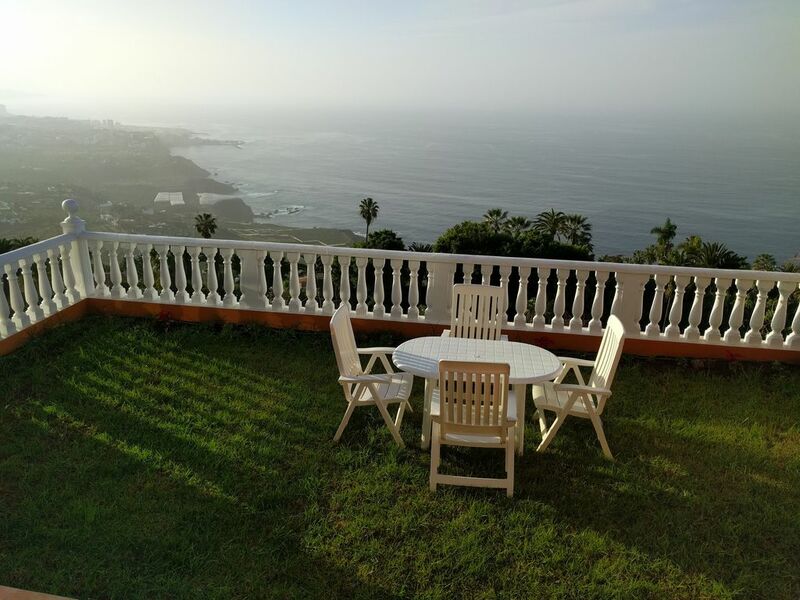 Beatiful villa with wonderful views over the Ocean and the Orotava Valley. Very well communicated, only 10 minutes from Puerto La Cruz beaches and touristic attractions. Fully remodeled and decorated, and with four large bedrooms for 6 people and 2.5 bathrooms. Includes protected garage for one car. Walking distance from some of the best restaurants in the North of Tenerife, and only 100 meters from a supermarket open from Monday to Sunday. Wireless WIFI and 43 inches Satellite TV. The best place to relax and enjoy everything Tenerife has to offer. Looking forward to host you. chaleureux. Pour faire court, nous avons été ravis de notre expérience. Thank you very much for your kind words. We are happy you enjoyed your stay and you will be always welcome back! Had 10 great days here need a car but good location to tour from. Lots of space plus balconies everything you need to self cater but even better a choice of good restaurants close by. Super Ferienhaus, komplett ausgestattet, es fehlt an Nichts, selbst in der Küche sind alle Gewürze vorhanden. Toller Ausblick zum Meer und dem Teide. Urige kleine Kneipen in der nahen Umgebung. Einkaufsmöglicheiten ebenfalls nahe gelegen. Ein Mietwagen ist grundsätzlich von Vorteil. Kleiner Wermutstropfen: Die Autobahn führt unterhalb des Ferienhauses entlang. Daran gewöhnt man sich jedoch recht schnell. Kurz und gut: Das Feriendomzil ist 100prozentig weiter zu empfehlen. Thank you very much for your kind words. We are very happy about you enjoying your stay in our house. Very welcome any time you want to come back. It was a pleasure hosting you and your family. Großes, gut ausgestattetes Haus mit tollem Ausblick.